Students had a chance to be heard, to tell their stories of challenges at Syracuse University and their hopes for its future, in a discussion meant to be just the beginning. 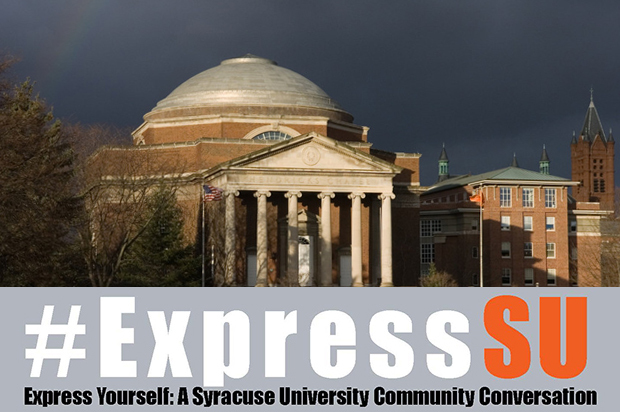 More than 250 students, faculty and staff gathered to speak and listen at “Express Yourself: A Syracuse University Community Conversation on Diversity and Inclusion” Thursday at Hendricks Chapel. The event was organized by students and University leaders as a way for students to share their perspectives on the challenges of diversity on campus as the entire community works toward becoming more inclusive. Students, who could also share their stories using the hashtag #ExpressSU, discussed concerns about feelings of a segregated campus among students and a sense of entitlement by some, while others feel the need to constantly prove their value on campus. They also noted concerns about the status of certain programs that are geared to diversity. Others shared personal stories of specific incidents and their particular circumstances. The forum was initiated following a publicized incident involving racist and homophobic language by a student and shared in a video on social media in September. However, the event wasn’t just about one incident, but about larger issues in the community, said Brittany Moore ’15, student engagement chair for the Student Association, who moderated the event. Chancellor and President Kent Syverud, along with many administrators, were present to hear the discussion. “I am here to listen and to learn from what I hear,” he said. Vice Chancellor and Provost Eric Spina and Senior Vice President and Dean of Student Affairs Rebecca Reed Kantrowitz addressed several specific requests and ideas that had been brought up at previous student gatherings in September. In one area, students suggested more avenues to engage and educate students on issues of privilege and identity. Spina noted a small group of students and faculty, led by Associate Provost for Academic Programs Andria Costello Staniec and Assistant Professor in Cultural Foundations of Education Gretchen Lopez, will meet to discuss what kinds of experiences might be made available or implemented for students. increased communication between student leaders and University leadership, led by Tiffany Steinwert, dean of Hendricks Chapel; Dalia Rodriguez, associate professor of Cultural Foundations of Education; and Kal Alston, senior vice president for human capital development. During the open forum, students were asked to share their comments on what challenges they have faced at Syracuse University and also where have they found hope. Students discussed how they feel others view their presence on campus is only due to their being a student of color, how there needs to be more dialogue about diversity and how there is a lack of understanding for people with disabilities. Others addressed the need for more campus spaces to engage in dialogue and share concerns. Students shared how they have found hope in how people of color are united, in professors who care about students and in the various campus organizations, such as the Office of Multicultural Affairs, the Disability Office, the LGBT Resource Center and the Newman Association, that support students. Jermaine Soto, a doctoral candidate in cultural foundations of education and a team member of Intergroup Dialogue, spoke on the meaning of allyship and the need to use one’s privileged identity to support others. Chancellor Syverud highlighted the common threads of what he heard from the forum’s participants, including the concern that students ask to be heard, a sense of loneliness and the need to join all students in the discussions. He also noted how understanding diversity involves various identities, whether identities of race, gender, socioeconomic status or those with disabilities. “Instead of a culture where some people are entitled to be here and some people have to constantly prove and bear witness to why they are here, we want a culture where who belongs here is everybody who is here,” Chancellor Syverud said. As with the chancellors who preceded him, there will be difficult discussions and decisions ahead during his term. “And when they come, I’m going to need all the diverse communities of the University to come together to face them,” Chancellor Syverud said. For updates and information, visit http://syr.edu/currentstudents/expressSU.html.